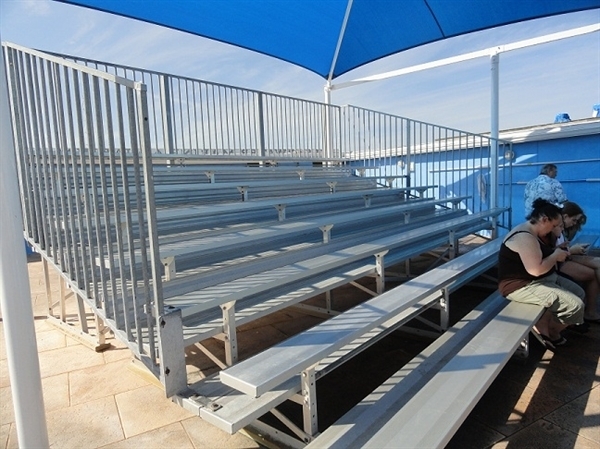 This 21 foot 10 row bleacher with 4 inch vertical bar guardrail will add seating to your school or sporting event. Seats and double foot board aisles are made of 2x10 anodized aluminum planks with room for 140. Aisles have an 8 inch rise with the first row at 17 inch. Galvanized steel frames are fabricated from A36 alloy steel angles using full welds at all joints to give added strength. This set includes guardrails and full foot boards with risers for safety. Always check with the local codes for compliance. Our features are designed to meet most areas safety requirements. Many years of heavy use makes our school bleachers a best buy.